The definition of accuracy in the ICH guidelines on the validation of analytical procedures  states that accuracy ‘is sometimes termed trueness’. In fact trueness refers to ‘the closeness of agreement between the average value obtained from a large series of test results and an accepted value’ . 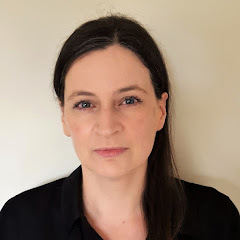 It gives an indication of the bias for an analytical method, whereas accuracy relates to the absence of error in an individual result and is defined as ‘the closeness of agreement between a test result and the accepted reference value’ . Therefore accuracy is an expression of both trueness and precision since both these influence the result. The consequence of this distinction in definitions, when performing the validation investigation of an analytical method, is that the accuracy is determined for each of the individual test results generated during the study but when the overall result is expressed as a mean, this value is actually the trueness of the method. The difference between accuracy and precision is usually demonstrated graphically using the pattern of shots on a target. In the figure shown on the left [reproduced from reference 3] four targets are shown. In the bottom left hand target the pattern of shots is relatively spaced out and away from the centre of the target. The precision is low since the shots are not close together and the trueness is low because the shots are not at the centre of the target. In the top left hand target the pattern of shots is also relatively spaced out but this time they are clustered around the centre of the target. The precision is low since the shots are not close together but the trueness is improved because the shots are clustered around the centre of the target. In the bottom right hand target the pattern of the shots is relatively close to each other and away from the centre of the target. The precision is improved since the shots are clustered close together but the trueness is low because the shots are not at the centre of the target. In the top right hand target the pattern of the shots is relatively close to each other and clustered around the centre of the target. The precision is high since the shots are clustered close together and the trueness is high because the shots are at the centre of the target. From the figure it can be seen that the closeness of an individual test result to the accepted reference value (indicated by the centre of the target) improves along the arrow shown. The conclusion that can be drawn from this is that the accuracy of the test results increases with increasing precision and increasing trueness and therefore is a measure of both of these validation parameters. 1. International Conference on Harmonisation (ICH) of Technical Requirements for Registration of Pharmaceuticals for Human Use, Topic Q2 (R1): Validation of Analytical Procedures: Text and Methodology, 2005, http://www.ich.org/. 2. ISO 5725, Application of Statistics – Accuracy (Trueness and Precision) of the Results and Methods of Measurement – parts 1 to 6, International Organisation of Standardization (ISO), Geneva, 2006. 3. Analytical Methods Committee, AMC Technical Brief, 2003, No. 13, ‘Terminology – the key to understanding analytical science. 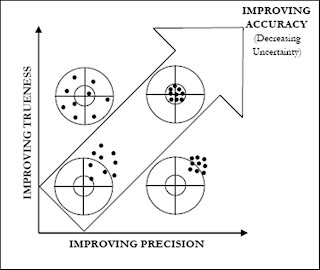 Part 1: Accuracy, precision and uncertainty’ (available on RSC website, http://www.rsc.org/). All scientific fields use a range of acronyms to refer to their technologies, organisations and common terms. The field of pharmaceutical analysis is no exception. 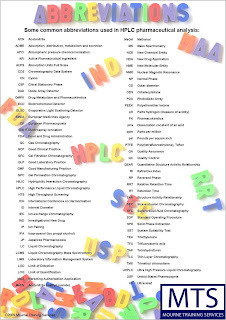 This free poster sums up some of the most common abbreviations encountered when using HPLC to analyse pharmaceuticals. It will help you to understand conversations in a world where people routinely talk using letters instead of words. To print the poster, just click on the picture on the right. You may need to select an option such as ‘Fit to printable area’ if your printer does not print to the edge of the page. Although the copyright for this poster is retained by Mourne Training Services, permission is granted for you to print off copies as required for non-commercial use. Please feel free to leave suggestions for other acronyms/abbreviations which should be included in the list using the comments function at the end of this post.